My guest today is Courtney Kirschbaum, who I had the pleasure of speaking with after her keynote address at the Georgia Society of CPAs’ Southeastern Accounting Show in Atlanta. Courtney’s keynote address was titled “The Beginning of the End or the End of the Beginning?” and it focuses on the idea that everything old is new again, especially when it comes to panicking about the younger generation. Sound familiar? Because 2000 years later, some older folks are still singing this tune – and yet, things are still getting done. The sad truth is that the work culture in Japan has led to thousands of deaths, to the point where the government is now involved – and our culture here in the U.S. isn’t so different. The average workweek is 47 hours now. Not only that, from 2000 to 2014, the productivity at work increased by 21.6% – but, at the same time, the remuneration only increased by 1.8%. And that is simply unsustainable. So let’s all cut each other some slack, let’s learn what we can about self-care from the younger generation, and let’s add a little humanity to the equation; Let’s just bring some humanity into the boardroom, into the conference room, into our meetings, into how we manage our people, and how we interact with our people. The evidence that treating people like people isn’t just nice, but a financially viable strategy, is abundant. So do you have the guts to do it? Courtney Kirschbaum: [00:00:00] Give humanity a seat at the table and don’t just ask, “Will it work? Is it profitable? Is it right?” but “Is it humane?” It’s really simple. Just bring some humanity into the boardroom, into the conference room, into your meeting, and into how you manage your people, and how you interact with your people. 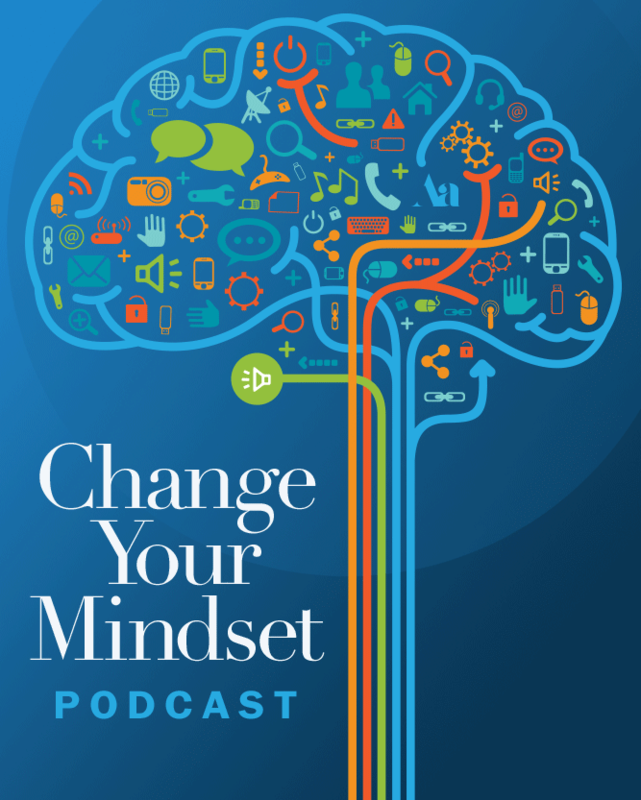 Peter Margaritis: [00:00:25] Welcome to Change your Mindset Podcast, formerly known as Improv is No Joke, where it’s all about believing in strong communication skills are the best way in delivering your technical accounting knowledge and growing your business. An effective way of building stronger communication skills is by embracing the principles of applied improvisation. Peter Margaritis: [00:00:46] Your host is Peter Margaritis, CPA a.k.a. The Accidental Accountant. And he will interview financial professionals and business leaders to find their secret in building stronger relationships with their clients, customers, associates, and peers, all the while growing their businesses. So, let’s start the show. Peter Margaritis: [00:01:11] Welcome to Episode 12. And my guest today is Courtney Kirschbaum. And I caught up with her at the Georgia Society of CPAs Southeastern Accounting Show in Atlanta. Now, Courtney is a global career strategist and a keynote speaker. And she’ll help you manage your talent and create a strategy for more profitable career. Peter Margaritis: [00:01:30] As she writes on her website, “Are you on schedule? And where do you want to be in the arc of your career? Are you happily working at your potential or feeling frustrated beneath it? If you’re not where you want to be, does your employer care? Are they promoting and advancing when you’re ready or at their convenience, usually, long after you’re ready? If you want that title recognition and salary that reflects your high performance and your potential, to put a plan and strategy in place to get the results you want on your timeline, to transition successfully from the employee to entrepreneur, then contact Courtney by going to our website, CourtneyKirschbaum.com. Peter Margaritis: [00:02:16] Our conversation focuses on her opening keynote address in Atlanta: The Beginning of the End or the End of the Beginning? And I’ll let the interview speak for itself. But before we get to the interview, I want to share an interesting blog that I found on Watershed Associates titled Negotiation Lessons from Improv “Yes, and.” I wonder why I picked this one. Peter Margaritis: [00:02:41] In the article, the author discusses two main principles that improv teaches that will make you a better negotiator. Number one, be a better listener. And to do this, you have to be present, and in the moment, and drop your agenda, and listen to what the other person is saying. If you’re rehearsing what you want to say next while the other party is talking, you’re going to miss out on some real important information. Peter Margaritis: [00:03:09] Number two, “Yes, and.” We use “Yes, and” to keep the conversation moving at a positive direction, and to help keep our emotions in check. In the article, the author writes. “Actually, saying yes in negotiations can have dreadful ramifications. So, in negotiations, we want to be a bit more verbose. Try saying, “Yes, I see what you mean and,” or “Yes, I’m beginning to understand and,” or “Yes, you have some valid points and.” You get the idea. So, go find this article, and read it, and become a better improviser during any type of negotiating situation. Peter Margaritis: [00:03:50] One more thing, let me ask you a question. Are you tired of getting the deer in the headlights look when you trying to explain an accounting or tax-related issue? Then, read my book, Taking the Numb out of Numbers: Explaining and Presenting Financial Information with Confidence and Clarity, and let it be the guide in your transformation. Peter Margaritis: [00:04:10] When you take the numb out of numbers, that leaves you with ERS, effective relatable stories. And isn’t that the goal of every financial presentation? Hayden Williams, who’s the CFO at the Washington Society of CPAs is quoted saying, “A must read for any financial professional.” The book is now available on Amazon, in paperback, and in Kindle. So, stop what you’re doing and go buy it today. Now, without further ado, let’s get to the interview with Courtney Kirschbaum. Courtney Kirschbaum: [00:04:55] Big conference. Peter Margaritis: [00:04:55] Yes. And one of the reasons why I came down is a friend of mine, Courtney Kirschbaum, was the opening keynote session for the, as they say, SEA Southeastern Accounting Show Conference. And she kicked it off this morning big time. Her topic was The Beginning of the End or the End of the Beginning? So, I’ve got Courtney here, and we’re going to talk about her session this morning and how it relates to the accounting profession. So, it’s wonderful seeing you. I loved your session. I love taking photos of you for your website. I heard the big round of applause, and I knew you did well. So, welcome, Courtney. Courtney Kirschbaum: [00:05:38] Thank you, Peter. It is great to be here with you. I was so happy when I found out we were both going to be here. And it’s great to be at SEA. This is a great conference. Peter Margaritis: [00:05:45] So, what was the premise of the conversation that you had with your audience? But folks, by the way, it was a big audience. I think, there’s like 1200 people here. There had to be, at least, a thousand in that room. Courtney Kirschbaum: [00:05:56] It was a big room, a lot of folks. And I’ll tell you how I got the idea for this talk. Every generation, I’ve noticed — I’m old enough to notice this now, which is scary enough — but do you notice how, you know, you’ve got this uncle or someone that, you know, that’s like, “Kids today. The world’s going to hell in a hand basket.” That is the phrase. It’s like we are in trouble. Courtney Kirschbaum: [00:06:51] So, it just got me thinking like everybody thinks that their beginning and their end is like the ultimate beginning and the end. And there are so many — anybody who had been in business for even a short while knows that so much of what we see is just something old with a new name. Courtney Kirschbaum: [00:07:04] So, that’s how it started. That’s how I got the idea. Peter Margaritis: [00:07:29] “How many of you had long hair? How many of you smoked pot, dropped acid? What did you guys? Do you remember? And your parents of the Silent Generation, that was the opposite of what they liked.” And they get this really not-me look. Courtney Kirschbaum: [00:07:44] It’s not my fault how they turned out. Courtney Kirschbaum: [00:07:47] I think, there’s almost a slingshot effect. Every generation gets the opportunity to observe their parents. And a lot of the complaints I heard about millennials, everybody’s heard this, “Oh, they don’t want to work. I can’t get him to come to work.” And the reason, one of the reasons for this is that millennials saw their parents kind of give their entire lives over to work, and they saw their parents’ marriages fail, and they saw the result of that, and they thought, “Well, what’s so great about work if you give it everything you got, and then you end up divorced and unhappy,” you know, whatever. That’s just one slice of it. Courtney Kirschbaum: [00:08:24] But I’ve always been a little bit more empathetic to that perspective. I think, I must be an honorary millennial. I really must be because, you know, I worked for many years, and I’m in the, you know, big four firms, demanding job, and I’ve kind of thought some of what they were saying made sense. Courtney Kirschbaum: [00:08:41] So, I’ve always tried to kind of speak for the side of that up-and-coming generation because when you’re young, you don’t have any sense of perspective on your experience. When I think about, you know, what I thought about work, and my job when I was in my 20s and 30s, I get it now. But, now, I’ve got, you know, some perspective on it. And I feel — And this is really corny, but I really feel like when you start, you don’t know a lot. And work is one place where you don’t want anybody to know that you don’t know anything. I mean, and that will stay with you until the day you retire. Courtney Kirschbaum: [00:09:39] And I just think that’s universally true. And I talk about, you know, these continuums. I talked about them today. And I’ve always had this natural inclination to think, you know, “Let’s give them a chance. Let’s see what they can do,” because we’re all pretending we know a little more than we know or have at one time or another. Peter Margaritis: [00:09:56] Exactly. And I don’t like to use the M word. Courtney Kirschbaum: [00:09:59] I honestly stay away from it too. Peter Margaritis: [00:10:01] I call it the younger generation. Courtney Kirschbaum: [00:10:03] Yeah, that’s great. Courtney Kirschbaum: [00:10:18] Exactly, exactly. Peter Margaritis: [00:10:18] The millennials are, you know, in their 30s now. And we all have different — You know, going in public accounting, why would I want to be a partner of a firm when I see these partners killing themselves? Peter Margaritis: [00:10:33] And work as many hours. And they shouldn’t try to figure why I have no succession plan. Well, you’ve got to redesign the firm to make it something that you’d want somebody to do. Courtney Kirschbaum: [00:10:43] Exactly. I love millennials. I mean, I’ll just say it straight up. I love millennials, and I love what they’ve done for the workforce because they stand up for themselves, and they stand up for their — you know, that work-life balance. You know, I talked about karoshi in the talk today. I worked in Japan in 2003. Peter Margaritis: [00:11:02] That’s right. Courtney Kirschbaum: [00:11:02] I worked in Japan in 2003. And I told the story in the talk today. I would walk to work. I walk to the subway station, and then go to work. And, occasionally, I would see somebody asleep in their car. Now, I was in my 30s, and I thought, “Oh they must have had too much sake and lost their apartment keys.” You know, what’s the Japanese word for that? Courtney Kirschbaum: [00:11:24] But years later, in 2015, I was back in the States, and I read an article in The Washington Post that said — the headline was, ” Are the Japanese Working Themselves to Death?” And I had been there in 2003, and I’d seen how embedded they were in this work culture, and how that it was so important to them not to bring shame upon themselves. This is fundamental to their culture, and where it shows up is at work. Courtney Kirschbaum: [00:12:06] … has taken hold. In the last 13 years since I was there, it’s taking hold, and thousands of Japanese are literally killing themselves. The government has gotten involved. And I was there at the beginning of it, and burnout is a real issue in our workplace today. Now, in Japan, you can’t leave a job as easy as you can in the States. So, how it’s showing up in the States it’s showing up as churn, as attrition. Somebody begins to feel burnout and they leave. Courtney Kirschbaum: [00:12:32] And just like in Japan, but we aren’t as intense as the Japanese in this way, people don’t want to admit that they can’t take on more of the workloads too much. You know, they want to honor their obligations to their boss, to their teams, to their companies. You know, I believe people really want to do a good job at work, and they’re killing themselves in Japan to do that. Courtney Kirschbaum: [00:12:53] And it’s going to come here. I think, it might come more slowly, it might take a different form, but we are turning into a culture that is work-obsessed. Well, we’ve been there for a while. The workweek is 47 hours now. That’s like the real average workweek. And interesting statistic, from 2000 to 2014, the increase in productivity at work is 21.6%. The increase in remuneration is 1.8%. And you just can’t continue to do that to people. Courtney Kirschbaum: [00:13:29] You know, I’m a career strategist. I talk to a lot of people about their careers, and they say, “You know, I’m getting more work, but I’m not getting anything else. I’m not getting more recognition. I’m not getting more remuneration. I’m not getting more authority.” And 15 years ago, when I was my generation’s version of a millennial, I wouldn’t have known what to do with this information. I didn’t, but I can put it together now because I have the benefit of that experience. Courtney Kirschbaum: [00:13:56] And when I first put this together, I thought, you know, does anybody want to hear this? Because when you’re in that work mode, it’s like take one for the team, you know, pull an all-nighter, do you have to do, but that’s what put Japan in the place it is now. And that’s why they have this issue, you know, with karoshi. And the government has gotten involved, and is talking to companies, and saying, “You know, make your employees take their vacation, and be sensitive to this.” And they have a real problem. It is not uncommon for people in their 30s in Japan to have a heart attack. Courtney Kirschbaum: [00:14:28] That’s just not right. Courtney Kirschbaum: [00:14:47] At least. Peter Margaritis: [00:14:48] But this whole thing about saving face, not make a mistake is real. And, now, we bring it to us. We have that same thing when you’re coming — You know, I call it that stage one competency. I don’t know what I don’t know, you know. Courtney Kirschbaum: [00:15:01] Yeah, yeah. Peter Margaritis: [00:15:02] But I don’t want to ask the question because I’m afraid to ask because everybody thinks I’m smarter than I probably am. And recently, someone gave me the acronym for the word FAIL, first attempt in learning. Courtney Kirschbaum: [00:15:15] I love that. Peter Margaritis: [00:15:17] I love it too, and I use it more and more. And it’s good. It’s okay to fail. It’s okay to make a mistake because you’re human. Peter Margaritis: [00:15:27] But when you make a mistake, come with the solution. And I don’t know if managers, partners, CFOs, controllers are teaching their people about it’s okay to make a mistake, but figure out the solution before you bring it to me. Courtney Kirschbaum: [00:15:43] I don’t — You know, I think the dialogue in every company is different. I would like to point out that while they’ve given a word to death by work in Japan, they do not have a word for work-life balance, which I thought was kind of scary and interesting. Peter Margaritis: [00:15:57] Coincidence? I don’t think so. Courtney Kirschbaum: [00:15:59] Yeah, no kidding. Well, here, you know, at least, we’re talking about it. And I heard this other great term, which is work-life integration. I thought that was kind of interesting. You know, old thing, new name. Peter Margaritis: [00:16:08] Right, right. Courtney Kirschbaum: [00:17:01] And people need to be called out on it because it doesn’t serve the people who are at that, you know, in the beginning and end of those transitions. Like these universal continuums are from curious to in the know, from alone to connected, and from insecure to empowered. Courtney Kirschbaum: [00:17:17] So, this is you in the first grade, not knowing anything or anybody, and feeling insecure. And then, you work, and you get to know the system, and you go from curious to in the know, and you go from alone to having friends, and connections, and a network, and being power. And that makes you feel, you know, less insecure and more empowered. Courtney Kirschbaum: [00:17:36] And that’s what we all go through continually in our lives. And it’s tough at work, again, because we really stigmatize mistakes. And at school, it’s kind of objective. You’re here to make mistakes to learn. But by the time you get to work, okay, we need you to be perfect now. Courtney Kirschbaum: [00:17:53] So, mistakes are stigmatized. And if we invite people into the workforce or people come into our workforce, they arrive at the threshold of your firm or your company, and they’re not supported through that transition. Nobody wins. And we are all constantly making that transition, you know, from one end of those continuums to the other. Courtney Kirschbaum: [00:18:13] So, it really behooves us all. It’s like let’s all cut each other some slack, and let’s add a little humanity to the equation. And that’s really what the talk was kind of saying. Like, if you look at all the situations and all the changes that are going on, in all beginnings and endings, speak up for humanity. You know, speak up and say, “Yeah, this is right, and it’s profitable, and we’ll get the result we want, but is this the humane thing to do?”. Peter Margaritis: [00:18:57] It’s funny you should say that because over the last six months, there’s a theme that’s been rolling through Harvard Business Review articles, and that theme is human leadership. That theme is empathy. Courtney Kirschbaum: [00:19:15] You got it. Peter Margaritis: [00:19:15] And it is. It’s about, you know, we might be an asset to a firm, but we’re people because we’re in the people business. And the more that we can engage our people, the more our business will grow versus the more we try to control them, it’s not going to grow. But I think this has always been the case, but maybe it’s this younger generation that’s finally making us realize, you know, there’s another side to this. Courtney Kirschbaum: [00:19:59] Like you said, you don’t know what you don’t know. Courtney Kirschbaum: [00:20:08] And, I think, people get to that phase faster. Just as you said, you create that environment where you say, “Ask. We don’t expect you to know everything.” And I saw that. You know, I’ve been out of the corporate world for six years now. And I will say, I did see that right before I left. Like, “It’s okay to ask. We don’t expect you to know everything.” So, I think there’s some of it emerging. Courtney Kirschbaum: [00:20:33] And, you know, I just want to give it a voice because if you put up with things that you know aren’t working, and you participate in them just because you think it’s the right thing to do, and you’re afraid to question, not just, you know, ask questions about, “Hey, what you don’t know with respect to audit or a tax form?” but, you know, are we really doing the right thing here? Courtney Kirschbaum: [00:20:54] You know, that needs to be heard because this new generation is bringing in, you know, some new ideas. They’re the most well-educated group, you know, to enter the workforce. They started interning and taking advanced classes sooner. Now, I’m speaking about Gen-Z. So, they are turning 22 this year. They’re entering the workforce. These are kids who have been going to summer school to get college credit, have been doing free, you know, unpaid internships. So, by the time they get, you know, or trying to get into college, or are trying to get a job, I mean, they’ve been doing internships, some of them since high school. They’re not slackers. Peter Margaritis: [00:21:36] No, they’re not. Courtney Kirschbaum: [00:21:36] They felt pressure and worked to deliver from a younger age than any previous generation. Peter Margaritis: [00:21:43] You know, my son’s in a Gen Z, Z, Z, Z, Z generation. It’s like he snoozes all the time. But to the fact, there — You said internship. So, I looked at the internship programs right now while you’re in college to be a waste of their time. Especially the way technology is changing, they’re not going to have to do the number crunching, per se. We’re going to have artificial intelligence and block chain to do that, but they’re going to need to know how to communicate and interact with people. Peter Margaritis: [00:22:16] My son was a thumbs-only kind of guy. Courtney Kirschbaum: [00:22:19] I got it, yup, very true. Peter Margaritis: [00:22:20] And then, he turned 16. And then, he got a job in a restaurant as a busboy. He’s been there two years. The kid can hold a conversation. We saw this almost automatically. Courtney Kirschbaum: [00:22:30] That’s great. Peter Margaritis: [00:22:32] And this is what we need our workforce to be like. The Gen Z, to be able to communicate, don’t put them in an accounting firm, make them go to work in a restaurant. Make them go to work in food service or retail where they got to deal with the public. There’s a benefit. Courtney Kirschbaum: [00:22:44] I completely agree. And I think that Gen Z actually will welcome that. I think they’ll really welcome it. There’s a perfect example of the human touch versus this artificial intelligence because everybody is talking about artificial intelligence, block chain, “Oh my god, is it going to take my job?” It’s a great example. So, we’re here in Atlanta, Georgia, which is where Chick-fil-A was found. Peter Margaritis: [00:23:07] Yes, love Chick-fil-A. Courtney Kirschbaum: [00:23:08] Oh, me too. Peter Margaritis: [00:23:08] I love Chick-fil-A. Courtney Kirschbaum: [00:23:08] I’ve been talking about chick fly all day. So, this is the really interesting thing that Chick-fil-A has done. Chick-fil-A, and you know this if you are a Chick-fil-A fan, and you have been to their drive through, has put people out in their parking lots, and you don’t talk to a box and a speaker, you talk to someone who says, “Hey, how’s your day going?” And they smile at you, and they say thank you, and they show human warmth. You have a human connection. They put your order on a tablet. Courtney Kirschbaum: [00:23:38] Now, here’s what’s interesting. Chick-fil-A, the revenue of their restaurants is $4.4 million. That’s the average. Their closest chicken competitor is KFC, right, $1.1 million. Now, at the average fast food restaurant, 60% to 70% of their revenue comes from the drive-through. And you go to a drive-through because you want best service, right. Peter Margaritis: [00:24:00] Right, yeah. Courtney Kirschbaum: [00:24:01] That’s what you think. But Chick-fil-A, while they get great ratings on accuracy of their orders and the human experience that people are polite, they are 30 seconds slower than the average, than the average fast food restaurant, but they’re still blowing their competition away because people value that human experience. Courtney Kirschbaum: [00:24:22] And I think we’re going to see more of this because at the exact same time, McDonald’s, if you’ve been into McDonald’s recently — I know this makes me sound like all I do is eat fast food, but I swear I don’t. You go into McDonald’s, and there’s a kiosk. So, they’ve removed the human element, McDonald’s restaurants — And, of course, we’re comparing apples to oranges a little bit, McDonald’s restaurants, their average revenue in a year is two $2.5 million. Courtney Kirschbaum: [00:24:47] So, everybody’s like, “Oh, we have to automate. And the more we automate, the more money we’ll make.” But Chick-fil-A pulled back and said, “No, let’s-” Part of their value system is to have a positive influence on every one that comes into their store. Peter Margaritis: [00:25:03] Wow, what a concept. Peter Margaritis: [00:25:06] It’s a novel concept. That was in Vogue in the ’70s and ’80s. Courtney Kirschbaum: [00:25:10] It’s really more. Peter Margaritis: [00:25:10] And I think flashback, as it relates to that, needs to happen. Peter Margaritis: [00:25:13] And, actually, I was in Greenville, South Carolina last week, and they brought — You know, Chick-fil-A, they brought it in for the meal at the company I was with, and they told me the exact same story. Peter Margaritis: [00:25:23] In Columbus, Ohio, there’s one Chick-fil-A, and I’m not usually on that side of town, so I haven’t been there in a while. And I said, “When I’m over there, there’s always a line.” They get people now. What? And then, I hear, “All at the line please. Closer to one.” No, there’s a person that’s taking your order and moving you through the system versus “Now what?” They get it. Peter Margaritis: [00:25:47] And that podcast I was telling you about, Building the StoryBrand with Don Miller, he interviewed the CEO of Chick-fil-A. And he came out with a book two years ago. I think, it’s called Relevance. Peter Margaritis: [00:26:00] And if you get a chance, it’s an excellent interview. But that culture there will survive. Courtney Kirschbaum: [00:26:06] Yes, it will. Peter Margaritis: [00:26:07] How do you translate that culture into our profession? Courtney Kirschbaum: [00:26:10] So, here’s some of the things they did to do that, and it goes deep. It’s not just superficial. It’s not just training people. The first thing is it costs by comparison. If you want to open a McDonald’s franchise, you have to ante up $750,000. That’s a serious barrier. Courtney Kirschbaum: [00:26:31] You want to open up a Chick-fil-A franchise, the buy-in is $10,000, and they pay the physical building startup costs. Peter Margaritis: [00:26:41] Okay, okay. Courtney Kirschbaum: [00:26:41] $10,000, I mean, that’s nothing. It’s nothing certainly nothing compared to $750,000, which means they’re lowering barriers because their real criteria is, does this person embody the values, and will they run this operation embodying the values of Chick-fil-A? So, right out of the gate, they said values over money. Peter Margaritis: [00:27:00] Right. It’s interesting because we talked about this in Greenville. And you only get one store. Courtney Kirschbaum: [00:27:07] You can only have one store. Peter Margaritis: [00:27:08] One store. Peter Margaritis: [00:27:09] And you’re an owner/operator. Courtney Kirschbaum: [00:27:11] Absolutely. You can’t just disappear. You have to have a relationship, not only with your team, but you have to have a relationship. They expect you to have a relationship with other store owners. And, in fact, that’s how the in-person order taking, which just becomes — So, you know, what you see at all Chick-fil-As now, that started in Houston. And one store owner had the idea. And, of course, they’re not competing, they’re collaborating. So, now, it’s spread to other stores, and it’s become one of their hallmarks. Peter Margaritis: [00:28:08] It’s a more collaborative approach. Peter Margaritis: [00:28:09] So, in the accounting profession, whether you’re in public accounting, or in B&I, or whatever, how can we be more collaborative? How can we get more the best practices when we’re in competition, but it should be a friendly competition? Courtney Kirschbaum: [00:28:23] You know who you should ask? Courtney Kirschbaum: [00:28:25] The people who are coming into your firms, your youngest, your newest hires. Now, they won’t always be right, but they’ll tell you what they need. Courtney Kirschbaum: [00:28:34] And if you think about it, the ones who are most going to benefit from collaboration are the people who come in and don’t know that much, right. Courtney Kirschbaum: [00:28:41] When I think about when I started as a project manager and I didn’t know anything, and there are people who will attest to this, what would have helped me more than anything is not carrot and stick, but real collaboration. Courtney Kirschbaum: [00:28:53] And I lived in fear of getting it wrong, which I often did, and I figured it out. But I would have given anything to be asked rather than had assumptions made about what was the best way to get this information to me. Invariably, if you are a leader or a manager, and you’ve got people working on your teams, I think that’s a first step. It doesn’t mean you have to do everything they suggest, but it will really open your eyes, and they really do have the most benefit, I think. It certainly can accelerate their learning a lot if you have collaboration. Peter Margaritis: [00:29:26] I’ve said this many times before, the collective knowledge outside your office far exceeds the collective knowledge inside your office. Courtney Kirschbaum: [00:29:34] That’s great. It’s a great saying. Peter Margaritis: [00:29:36] So, you know, just because they’re new doesn’t mean that they they don’t know — They don’t know everything, we’ve already established that, but they know stuff that you don’t know. So, there’s the collaborative aspect. And someone told me, if you want to know what people are thinking, go on Twitter, and follow the people that they follow. Peter Margaritis: [00:29:54] That gives you an idea into their insight and what they’re seeing. Courtney Kirschbaum: [00:29:58] It’s a great idea. Peter Margaritis: [00:29:58] So, basically, you’re telling a firm to be more collaborative, or a CFO, or a finance department go to the collaboration aspect of it, and dropping barriers, dropping barriers to work, getting rid of the negativity, and more empathy and embracing? Courtney Kirschbaum: [00:30:17] Imagine that. Peter Margaritis: [00:30:18] So, I want to know, when you were kind of laying this out for this audience, did you get the stink eye at times? Courtney Kirschbaum: [00:30:25] I will be honest with you, when I started writing this talk, when I talked with Jen here at the Georgia Society of CPAs, and she’s been a guest in your podcast, Jen Oleksa. Peter Margaritis: [00:30:37] Yes, yeah. Courtney Kirschbaum: [00:30:37] I talked with her and she said, “You know, show them what the future. We want you to show them what the future is going to look like.” And I’ve been to a lot of conferences. We’ve all been through a lot of conferences. And I knew that I could talk about artificial intelligence and robots, but I just wanted to go a little bit deeper. Courtney Kirschbaum: [00:30:59] And I have to admit, I was a little self-conscious. I thought, you know, if I start talking about karoshi, and if I start talking about, you know, taking a different approach with people who are coming into our firms and pointing out that for 2000 years, we’ve been picking on the younger generation, and we might want to stop. Peter Margaritis: [00:31:14] Right, right, right, right, right. Courtney Kirschbaum: [00:31:16] You know, is this is this going to fly? But a lot of people have come up to me since I gave the talk and thanked me for bringing it up because I know from my own experience that this is what you talk about when your boss leaves, you know. And you’re young. So, you think, “Well, this is how the older, more experienced people are doing it. So, it must be right.”. Courtney Kirschbaum: [00:31:37] So, I was concerned, but I thought, you know, I don’t care. I really don’t care and here’s why. The last thing that I talked about in today’s talk was this Japanese — you know, the strong part of the Japanese culture, which is not to bring shame on yourself and to protect your honor. And I really thought, you know, I’m honor-bound to talk about this. You know, if they’re going to give me the stage and say, you know, share your point of view, then you have to be honest about it, and you can’t, you know, curtail what you say because some people are still, you know, embracing that, you know, “I walked to school uphill both ways, you know, in a rainstorm or in the snow.” And that doesn’t serve anybody. Courtney Kirschbaum: [00:32:22] So, that’s why I kind of held to it. And I really did — I often felt like people who are really wanting to do right, and do good, and deliver good work in work environments were treated — And this is a strong word, but they were treated inhumanely because we’re in a system. You know, it’s bureaucracy. And I saw that a lot. And I’m on stage talking about, you know, death by work and karoshi, and these are heavy topics, but they deserve attention. Courtney Kirschbaum: [00:32:52] They really deserve attention. So, that’s why — You know, and when you’re as a speaker, you scan the crowd. And people don’t always give up what they’re saying, and especially if they thought you weren’t thinking. At a professional conference, you know, your boss could be sitting next you. I can tell you, I was at a conference a few weeks ago, somebody handed me a note and said, “My boss is in the room, so I can’t ask this question,” this is what the note said, “but I need to talk to you.” So, there’s that, right? Peter Margaritis: [00:33:55] Oh my god. Courtney Kirschbaum: [00:33:58] It’s true. It’s true. Peter Margaritis: [00:34:04] … it makes you think of a firm I just worked with. And, actually, I’ve included them in my book. And it’s a firm in Maryland called Deleon & Stang. Now, the two partners who started this didn’t grow up in public accounting. And that was the key because they’ve been around for, I think, 25-30 years, and they just want through — At the beginning of the year, they went through kind of a rebranding. Their mission statement, always put clients before people. Peter Margaritis: [00:34:30] They redid that. Now, it’s people before clients. If we treat our people well — It’s almost a Richard Branson thing. I don’t worry about my clients. I worry about my people. If I get the right people, treat them right, they’ll take care of my customers, my clients. Courtney Kirschbaum: [00:34:43] They will. Peter Margaritis: [00:34:44] So, they also rolled out two new policy changes. During business season, there were no mandatory Saturdays and Sundays. Peter Margaritis: [00:34:57] But it gets better. They also rolled out unlimited PTO time. Peter Margaritis: [00:35:04] And I said — The light bulb went off in my head. I said, “Wow. A firm, an organization that trusts their people.” And that’s where it kind of boiled down to. There’s a lack of trust. And that’s why we get 2%. Peter Margaritis: [00:35:20] That’s why we’re — But when you trust your people — And research has showed they won’t take the whole of the PTO. They’d probably take less than they did before. Courtney Kirschbaum: [00:35:28] That’s what studies of this are showing that they end up taking less than before sometimes. Peter Margaritis: [00:35:32] But you are empowering them. Courtney Kirschbaum: [00:35:33] Yes, you are. And, now, I think there’s going to be an adjustment period for that. Like how do we behave with this new freedom? And I honestly think that’s normal. Peter Margaritis: [00:35:42] I agree. Courtney Kirschbaum: [00:35:42] It’s worth tracking. Peter Margaritis: [00:35:44] And they’re tracking last conversations I had. I mean, they were a little nervous about. Courtney Kirschbaum: [00:35:51] Yeah, I’ll bet. Peter Margaritis: [00:35:51] But they’re seeing the benefits. And, you know, I interviewed them for this podcast that aired about a couple months ago, and they talked about this whole culture, what they did, and they were afraid of it, but they’re seeing the benefits of it. Peter Margaritis: [00:36:18] … what if I train them, and they leave? What if I don’t train them — No. What if I train them, and they leave? And you go, “Well, if you don’t train them, what happens if they stay? Courtney Kirschbaum: [00:36:30] They stay. Peter Margaritis: [00:36:30] Yeah. And it’s — I think it boils down to the way we trust people. Courtney Kirschbaum: [00:36:33] Yeah. It’s kind of a fearlessness because, you know, a lot of these things aren’t new. Courtney Kirschbaum: [00:36:39] It’s just, do you have the guts to do it, or are you managing from a position of faith and intuition by trusting yourself because that’s the person you have to trust first and say, “Because evidence that this works, it’s everywhere, it’s abundant, but do you have the guts to do it?” because that’s — I really think it takes guts because it doesn’t take any guts to leave from fear. And I think there’s a lot of fear-based leadership. Peter Margaritis: [00:37:04] Yes. And I will truly — Yes. But I’ve been part of some fear-based leadership, and I witnessed fear-based leadership, and nothing good comes from fear-based. Courtney Kirschbaum: [00:37:11] It’s hard on people. It really is. Courtney Kirschbaum: [00:37:14] And it’s even hard on those leaders because they have to live in that environment too. You know, it’s not easy. Peter Margaritis: [00:37:20] I call that ego leadership. Courtney Kirschbaum: [00:37:22] Yeah, that’s a great way to put it. Peter Margaritis: [00:37:24] Yeah. And that doesn’t work, especially in today’s workforce. It’s got to be more of a collaborative. It’s got to be more of an empowering and embracing. You’ll get bigger rewards, not as much of an investment as you do with ego leadership, and people leaving, and having to continually reinvest. Courtney Kirschbaum: [00:37:43] Well, the baby boomers are leaving the workforce, and I think this is through — I mean, this is going to go on for several more years at a rate of 10,000 a day. Peter Margaritis: [00:37:53] Yeah, there you go. Courtney Kirschbaum: [00:37:53] They are rolling out the door. Courtney Kirschbaum: [00:38:21] There is a big jump. And I think we’re going to start seeing, once the boomers are gone, I think, more and more, it’s going to it’s going to show up. Like what is the real impact of this? Courtney Kirschbaum: [00:38:39] Don’t go anywhere. Don’t go anywhere. Peter Margaritis: [00:38:40] I had, you know — Because I’m a baby boomer, but my time, I had a bottle in my mouth, not a marijuana cigarette. Who takes marijuana cigarettes? Courtney Kirschbaum: [00:38:50] Yeah, that’s what you say now. Peter Margaritis: [00:38:52] Yeah, yeah. Courtney Kirschbaum: [00:38:52] That’s what you say now. Peter Margaritis: [00:38:52] Yeah, but — So, imparting words. Peter Margaritis: [00:38:57] What would you tell my audience to begin to do today? Courtney Kirschbaum: [00:39:01] Give humanity a seat at the table. Don’t see something that you know is stupid — And that’s the war with, “This is stupid. Why are they making us do this?” You know, think about the numbers that you’ve heard today. And I’ll give you just one or two more to close with. 23% of the workforce, this is a recent Gallup poll, says they feel burned out all or most of the time. Doctors’ offices are overwhelmed with people coming in with these non-specific ailments. That’s stress. Courtney Kirschbaum: [00:39:31] HR professionals, as many as 50% think a large amount of the attrition and turnover is from people who are burned out. And we see this. This isn’t a secret. This is just something we’re not talking about. 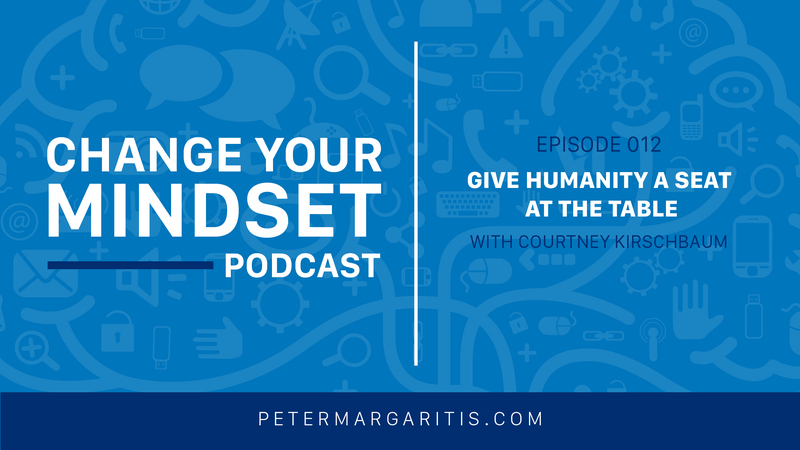 Courtney Kirschbaum: [00:39:44] Give humanity a seat at the table. And don’t just ask, “Will it work? Is it profitable? Is it right?” but “Is it humane?” It’s really simple. Just bring some humanity into the boardroom, into the conference room, into your meeting, and into how you manage your people, and how you interact with your people. Peter Margaritis: [00:40:02] Man, what a way to end. Give humanity a seat at the table. And that will be the title for this podcast episode. Courtney Kirschbaum: [00:40:09] Okay, I love it. Peter Margaritis: [00:40:10] And I love that our paths crosses. It’s been way too long. Courtney Kirschbaum: [00:40:15] It has been. Peter Margaritis: [00:40:15] We did a couple interviews via Zoom, but it’s great seeing you. You did a wonderful job today. I wish you all the best. I look forward to our paths crossing again soon. Courtney Kirschbaum: [00:40:23] I do too. Thank you, Peter. I love collaborating with you. Peter Margaritis: [00:40:28] I want to thank Courtney, once again, for taking her time with me in Atlanta to sit down and share her keynote with this audience. Peter Margaritis: [00:40:36] In Episode 13, my guests are Kristen Rampe, Founder of Slide Deck Improv, Jason Lieu who is one of her improv instructors, and one of her other improv instructors who will remain secret for now. But, by the way, all three of them are also CPAs. Thank you for listening, and begin the process of changing your mindset, and getting out of your comfort zone, and developing new skill set to become more future-ready. Peter Margaritis: [00:41:08] Your call to action is to read the article that I discussed earlier and apply those principles when you’re in any type of negotiation. Remember, a part of being future-ready is being an improviser. Being an improviser is someone who is willing to take risks in order to grow.